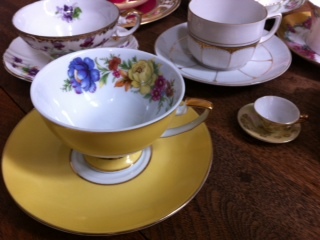 This entry was posted in Ancestors and tagged Bobbi Rankin, boomer, storytelling, tea cups. Bookmark the permalink. 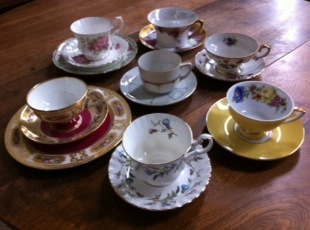 Your post reminds me of the bone china cups and saucers that my mother had from her mother, some of them handed down from her grandmother who was from England, and some given to her as wedding gifts back in the 1890s. Beautiful things, they were used on special occasions when company came. My brother and his wife have some of them. Thank you for writing and sharing about yours. Yes George, they were delicate and beautiful. My great grandparents came to the US in the 1890’s so we have some familiar insight into tea drinking and china cups. This is wonderful. It brought back memories of my mother’s tea cups she used for her “bridge parties.” Another epoch when wives had such time without the constraints of full time jobs. It seem as if many of us have similar remembrances of a time in the past. A time without the constraints of todays busy world. Nice post! Sometimes physical objects are the best reminders of those loved ones from our past. With my dad, it’s a photo of him with his flight crew in the Korean War. Memories are best, I think, when not cluttered with junk that doesn’t mean as much. The picture of your dad is simple and it tells a story. Thanks Kent for sharing that thought. What piece of memorabilia do you have that is precious to you Joan. Sometimes, as Kent wrote, it is simply a meaningful photo. Thanks and I’m glad you liked my story. What a wonderful post! I have a set of hand-painted china made especially for my mom. Have no idea what to do with it. I wish I liked tea! I know what you mean….as you read I too had that dilemma. Being a died in the wool coffee drinker, I’m happy with my solution. Maybe my story will inspire you. Thanks Jess.